Welcome to Kristen Flood, a YA science fiction author and poet. At twenty-two, Kristen published her first book, The Museum: A Collection of Dark Poetry. 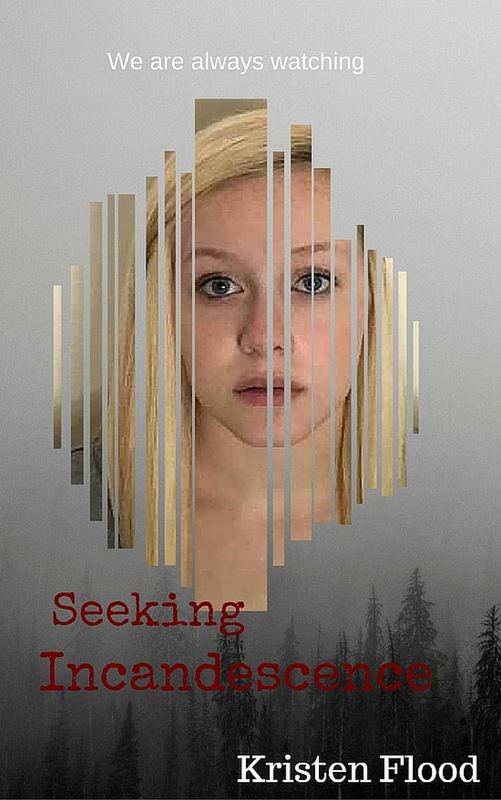 Now twenty-three, she has released her second book, Seeking Incandescence. Kristen lives in Missouri with her husband and son. When she’s not writing or chasing her toddler, she spends her time cramming for tests and turning in last-minute assignments at the University of Missouri St. Louis. Kristen plans to release two books in the coming year but until then, she is just trying to get through finals. 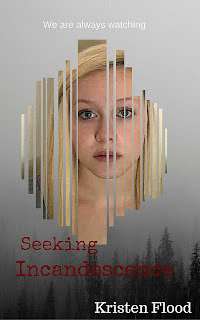 I'm offering the digital copy of my book, Seeking Incandescence, for free on my website kristenfloodbooks.com. Readers can also find my books on Amazon. The Writers’ Lens is about "Bringing fiction into focus." What brings your writing into focus-- the characters, the stories, the love of words? The tone of my characters brings their story into focus. I write on a stream of consciousness as the characters think, act, and develop. The tone they convey through their thoughts and actions is brought on by their very distinct personalities. This particularly can be seen through the characters' motivation. My character Pepper has this deep anger and fear of what the people in power of her world have done. She uses her illegal need for creativity to cope and her intelligence to stay afloat in the dangerous situation she finds herself in. Inno has trained her entire life to become this person her Mother has wanted her to be. But when she enters the real world, she finds herself struggling with her identity. That theme of identity is a big focus within this story. What makes us who we are? Mint, my third main character, is determined to succeed in this oppressive world but finds his natural human emotions to plague him with guilt. These character concepts bring a strong and defined tone, which brings into focus the power of standing up for what you believe in. What makes your book/characters unique? I think what makes my characters unique is the power of the parallels in their relationships. They are all so completely different as people, and they pull from their own unique strengths. Pepper finds strength in her language and creativity. She is constantly on the defense and uses her language as kind of chess match between characters. For her, winning the chess game is the only way to survive. Inno wants to understand this world she has been asked to save. She is struggling with viewing people as humans or collateral, and you can see this in the way she interacts with her friends. The language I use around Inno is sometimes set up in this poetic structure as the readers get a chance to see her thoughts. Mint finds Inno's methods to be reckless and their constant clashing is what makes their relationship so strong. Because every time she is able to find a unique way to do something he finds his own working understanding of the world to break apart. Is there a different genre or type of book you’d love to try to write? I never want to be confined to just one genre. My current books are YA Dystopian science fiction, and I love their world. But I have a deep love for fantasy, and I want my writing to show that in other works. Currently, I am working on an adult romantic fantasy set to come out in April. This fractured fairy-tale is just another way I want to express my creativity. But my first love will always YA and, with that in mind, I plan to release at least one YA book a year. So in August the sequel to my SI series, Crowing Iridescence, will come out. What are your top three reasons for writing? You know, I started writing because I couldn't focus. I had the Cinderella-story childhood, complete with the evil stepmom and a lot of chores. So during the tedious chores, I would space out and dream of these magical and amazing worlds. This would, in turn, get me into a lot of trouble from my stepmom, which always ended with upsetting punishments. So I decided to write the stories away so that I could get them out of my head. And these ideas left my head and found a new place in my heart as a writer. My stepmom and dad divorced a few years later, but my stories continued to flow because I had become a writer. So I write because the worlds and people I see are more extraordinary than the life I had once lived. I write because it brings me comfort. But most importantly, I write because I am crazy, and it's the only way to free myself from the distraction. If you could meet one of your characters, who would it be and where would you meet? I would love to meet Pepper. In the original story concept, she was a minor character who only showed up three times in the book. And even in those small moments, she made an impact on me. So I started thinking about her more, and I realized her part was so much bigger than I thought. As I started writing her, I began to fall for her words and her ideas. If I could meet Pepper, I just know I'd find her at the library reading a book about something wonderful. SEEKING INCANDESCENCE -- Inno shouldn’t exist. But she does. She is very real. Born illegally outside of the breeding facilities, she has been raised to believe that it is her duty to infiltrate Ares Academy and take down the government. But can she fit in with the obedient masses of the military? Pepper should be dead. She should have had her memories wiped and been placed on the streets to die. But she was immune. She has spent her life undergoing experiment after experiment and now has been charged with one task. But can she be trusted to spy for her captors? Mint is a military officer. The Seers have deemed him worthy of joining Ares Academy. There he will be molded into the perfect solider, the unshakable image of obedience, efficiency, and apathy. But what if there was another way? Is standing up worth standing out? The Adventure Continues for Brad R. Cook with Iron Lotus! Book Three of the Iron Chronicles is Now Available! Alexander Armitage is back in the thrilling conclusion to The Iron Chronicles. Refusing to return to Eton College, Alexander joins the Sky Raiders as a crewman on the aero-dirigible, Sparrowhawk. With Genevieve, the baron’s daughter, captured by the vile Colonel Hendrix, Alexander soars to the top of the world, and discovers the terrifying machines created by the Golden Circle to enslave the world. Betrayed by his allies, and aided by a mysterious woman and her clockwork owl, the race is on from the snow-covered peaks of the Himalayas, to the shining capital of the New World. In a steam-powered Victorian world where pirates prowl the sky and secret societies determine the future like a game of chess, Alexander learns that it is not gender, race, or age that determines a warriors worth as he is forced to choose between becoming a knight, or one of the Four Iron Horsemen. 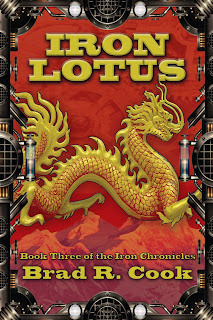 Order Iron Lotus online or from your favorite bookstore! Available in print and in multiple ebook formats. Watch the book trailer for Iron Lotus. See the book trailers for Iron Horsemen and Iron Lotus on YouTube. Want a signed copy? 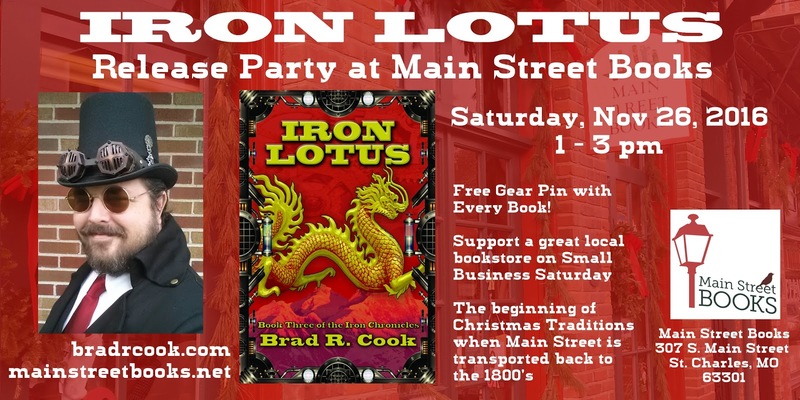 Join me on Saturday, November 26, 2016 for the Iron Lotus Release Party at Main Street Books! Support a great independent bookstore on Small Business Saturday! Plus yummy treats, and a free handmade gear pin with every one of my books. 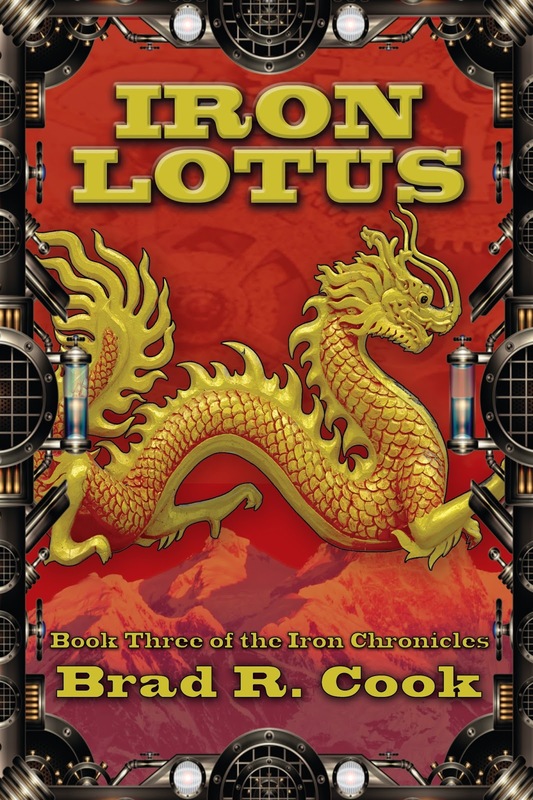 Brad R. Cook, author of the young adult steampunk series, The Iron Chronicles (treehouse publishing group), will see the release of book three, Iron Lotus, in November 2016. A former co-publisher and acquisitions editor for Blank Slate Press, he is a member of SCBWI, and currently serves as Historian of St. Louis Writers Guild after three and half years as President. A founding contributor to The Writers’ Lens, a resource blog for writers, he can be heard weekly as a panelist on Write Pack Radio. He learned to fence at thirteen, and never set down his sword, but prefers to curl up with his cat and a centuries’ old classic. Find more @bradrcook on Twitter, Instagram, and tumblr. Illustrations of the vehicles and characters, plus a more in-depth look at the history in the novels. Avengarde, by author and tutor Zachary Barnes, offers a tale of courage and humanity in the face of racism and genocide. Marking his debut in traditional publishing, Avengarde will be released by PandaMonk Publishing out of Annandale, Virginia. Distinguishing itself among fantasy books through its intimate point of view, Avengarde’s message warns against the seductive power of hate and is particularly timely given the current political climate of division and anger. Because of this, Avengarde is both poignant and fitting to our times. Avengarde’s protagonist, the maimed and clever Taveol, has found one final place of refuge: a city of ice and blood, perched on the frozen edge of the known world. Here, in Avengarde, he believes he is safe from the ghosts of his mercenary past. But when Taveol harbors Aerwyn—a wounded Fae fugitive—on the eve of an oncoming ethnic cleansing, the two exiles are caught in the middle of a vast racial conflict that is tearing their city apart, stone by stone. And when Taveol’s nemesis arrives at the head of a genocidal warband, the paths to survival and to revenge become that much harder to differentiate. Encircled by enemies old and new, Taveol must choose to either save himself or risk everything for the culture and people he has grown to love. Avengarde is available for purchase on Amazon and Barnes & Noble online, visit www.zacharybarnes.us for more. I asked Zachary a few questions about AVENGARDE and his writing process. While I love the idea of crafting words, that intensely cerebral kind of writing is actually when I’m at my worst—at least for the first draft. My writing becomes focused when I am in the groove of a storyline or scene and creating at breakneck speeds. Knowing that details can be honed later and that story and content take precedent is very freeing for me, since it allows me to create a raw chunk of story that is, at its core, true to itself and in line with my intent. What inspired your latest book, and what do you think readers will like about it? One evening when I was climbing into bed, I suddenly and quite vividly imagined a scene where an innkeeper was thrown out of his own inn by his rowdy patrons. It seemed nicely ironic, but I went to sleep without giving it a second thought. When I woke the next morning, the scene was still rattling around in my brain, so I decided to write it down, if only to keep it from pestering me throughout the day. This was the beginning of Avengarde, and although I eventually removed this particular scene from the final draft, I think it really set the tone from the start, at least for me. I really liked that scene, but I totally see why you pulled it. Along similar lines, I hope that readers will appreciate the protagonist’s self-deprecating humor. His internal asides and one-line quips were by far the most enjoyable part of the writing process, and I hope that readers can share some of that joy with me. I borrow quite a bit from history, which I find serves my goal of analyzing our reality through a distorted lens. So, were you to look at the details of my writing you would notice that many “facts” find a home in my fiction, although some of them change meaning when stripped of their context (which I also find both interesting and important). I steal anything from Balinese graveyard topengs to Vlad III’s penchant for violent foreign diplomacy and wend it into my own stories all with the intention of creating a world that is distinctly familiar, yet mysterious at the same time. What is your A+, number 1 writing/editing/query-reading snack? also, when I crash into a blubbering pile afterwards, I can conveniently blame my lack of any real writing progress on my physical state. It’s my all-time favorite perfect first draft beverage. If you could meet one of your characters, who would it be and where would you meet? As a rule, I choose to write about characters who are dissatisfied if not outright angry with their lot in life. They are in the perfect place to desire change and cause tension, both of which are important components of a gripping story. I’d probably move quickly past most of my characters if I met them walking to work, but the one person I might stop and chat with is Silje Blackeye—a three-hundred-year-old Fae general who, besides being a little too ornery, is a relatively level-headed guy. If I could, I’d take him on a hike through Great Falls and pick his brain with the hopes of learning a thing or two about the art of guerilla warfare. First off, if you have the correct tools—i.e. a pocket-sized hydrogen bomb and a can of peanut butter—remove the “backspace” and “delete” keys from your keyboard before you start the first draft. Both of these keys are evil and must be destroyed. If you are doing anything but generating content on the first go-through, you may be overthinking the process. Secondly, criticism is inevitable, so prepare yourself. When it comes to other writers, their opinions are just that; you should put their ideas in context with what you want to achieve and go from there. So true, your name is on the book. Lastly, sit down and write. Right now. Stop reading. I mean it. Go! *Jumps up, runs to computer, starts writing this blog* Wait. We’re not done. One final question, which line did you struggle with more, the first or the last? In the months of writing that led up to finishing Avengarde, I had been mulling over a big choice that would only be appropriately accomplished in the very last chapter. The decision was between true tragedy and a thematically jarring twist, and I knew that this choice would heavily influence the readers’ takeaway message. I ended up writing both endings, swapping them back and forth, and even “testing” them on my alpha readers. So, you might say that the actual lines were easy to write, but I took a long time deciding how cynical I wanted the ending to be. 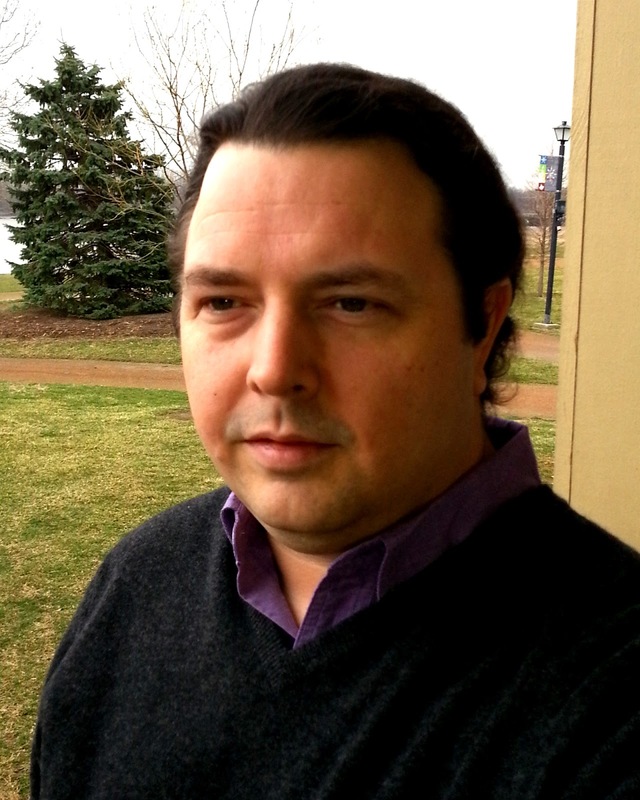 Zachary Barnes is a fantasy author who has been self-publishing since 2007. His first novel, Winter’s Throne, debuted in 2010. After attending James Madison University for Music Education, Zachary—originally from Pennsylvania—moved to Northern Virginia where he began his career in education and met his publishers. 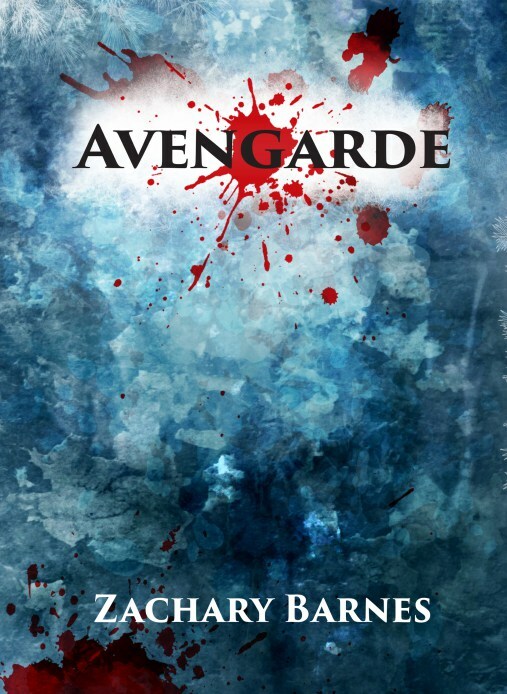 Avengarde represents Zachary’s first contracted book deal. 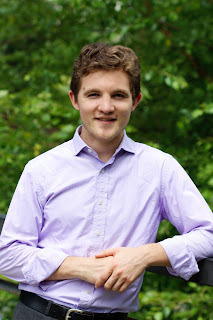 Currently, Zachary is the assistant manager and lead tutor at the Reading and Writing Center at Northern Virginia Community College, Annandale Campus. Join a celebration honoring award-winning young writers at the St. Louis Writers Guild’s annual holiday gathering from 10 a.m. to 1 p.m., Dec. 3, at the Kirkwood Community Center, 111 S. Geyer Rd., Kirkwood, MO 63122. Find out how these fourth- through eighth-graders created stories that all began with the same sentence: “It came from the fog….” Judging was based on originality, cohesiveness, spelling, punctuation, and grammar. It’s free to attend. 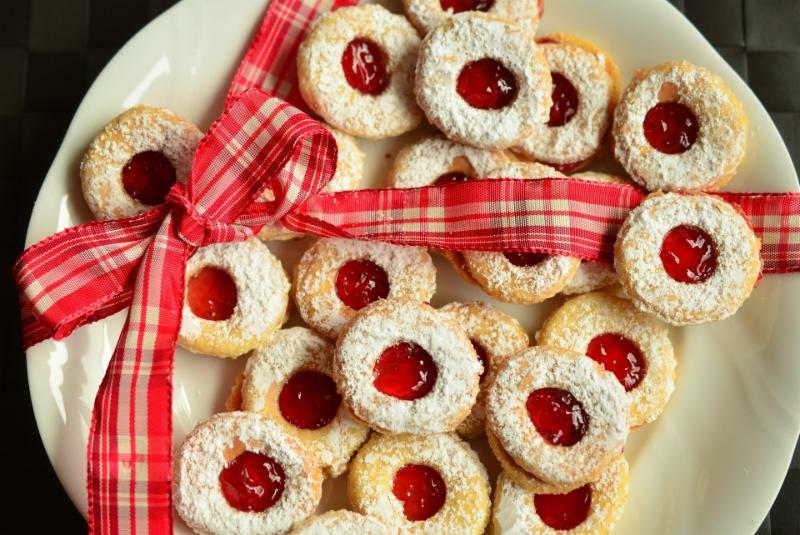 All are encouraged to bring a dish for a potluck luncheon that will follow readings by the contest winners.